Free Code Camp - OKC is a group for those who want to learn to code in the Oklahoma City area. We meet up every Sunday afternoon in person at StarSpace46 and on Twitch, in order to supplement the online learning with in-person guidance and instruction. We do our best to keep you up-to-date and moving forward in your career as web/software developers! Please see our Meetup Page for additional times and details, and to RSVP to let us know that you’re coming. If this is your first time visiting us, feel free to check out our First Timers page for some tips on attending your first meetup. You can also learn more about Free Code Camp - OKC and check out our blog page for instructional and inspiring articles written by our members. Check out some of the projects we have been working on. We also have a Slack room where we can have real-time discussions and offer help and advice when needed. Not sure how to use Slack? Check out our guide on getting started with Slack for more info. 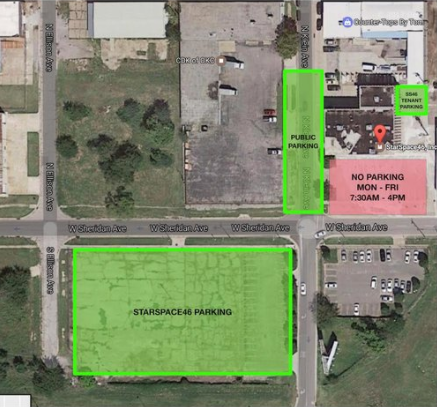 Parking is available 24/7 on the southside of Sheridan Ave in the large lot catty-corner across the street. You are at risk of being ticketed or towed if you park directly in front of the SS46 building Monday thru Friday between 7:30AM and 4:00PM. You are allowed to park in front of the SS46 building on weekends or after 4:00PM during the week.